Sophmore year I had a professor who shared with us that she was surrering from a brain tumor. She had told us that her DR brought to her attention that the tumor could have been caused by over-use of her cell phone. Thinking about this professor, I decided to look up an article related to the topic. I found an article by Environmental Working Group that discussed exactly this. Many studies are being conducted to discover if long term cell phone users are being diagnoesed with brain tumors. One study was started in the late 1990's by the International Agency for Research on Cancer. In 2008, 6 cases in the study found that there was an increase in risk for glioma, which is a tumor in the brain that comes abount from glial cells that provide support for the nervous system, especially on the ipsilateral side of the brian. The ipsilateral side of the brain absorbs anywhere from 97-99 percent of the electromagnetic enegry projected during cell phone calls. This was just one finding of many studies being conducted. The article also states that there are other health issues that can possibly be related to cell phone use as well, such as; migraines, vertigo, Alzheimer disease, and behavorial problems in children that we prenataly exposed to cell phone use by the mother. This is such a big concern because technology is the biggest aspect in today's society. Especially our generation. Teens and young adults are attached to their cell phones 24/7. I admit I am as well, but learning that cell phone use may lead to cancer makes me double think before I make a phone call. It makes me wonder what is more important; my life or my cell phone. 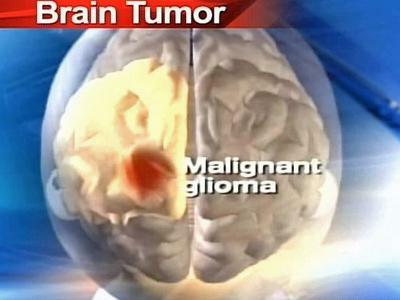 Picture above was taken from google images and is a picture of a brain with a glioma brain tumor.